Africa’s latest agreement is the second world’s largest after World Trade Organization (WTO). 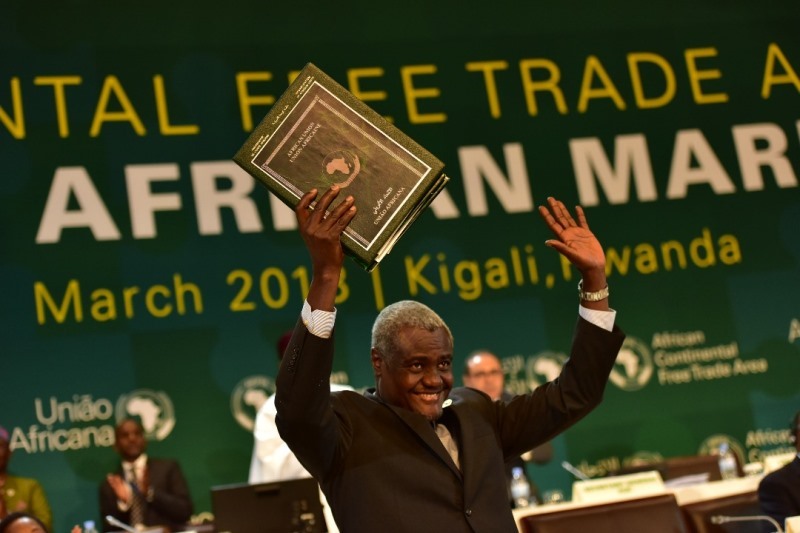 The decision to form the AfCFTA was adopted in January 2012 during the 18th Ordinary Session of the Assembly of Heads of State and Government of the AU while negotiations were launched by the AU in 2015. The AfCFTA was aimed at creating a single continental market for goods and services with free movement of businesses and investments. According to the AU, this will pave the way for the establishment of the Continental Customs Union and the African Customs Union. The AfCFTA could create an African market of over 1.2 billion people with a GDP of 2.5 trillion U.S. dollars. The agreement, after being signed, will be submitted for ratification by state parties before it can enter into force. Africa is a continent blessed with abundant resources both mineral and fertile lands, which ought to have catapulted it to highest global scales of political and socio-economic development and prosperity. However, the continent is reeling in squalor and dependent on foreign aid due to the vicious and evil hegemonic plundering launched by the Western colonialism! The colonialists have taken the continent hostage to date. They continue to instigate havoc and turmoil in the continent by using their colonial agents using proxy wars, Guinea pigs labs, free markets policies for their products, worst of all their importation of the secular capitalist ideology with liberalism as its cornerstone. On the other hand, the colonialists via their multinationals under the so-called direct financial investments (DFID) policies they engage in fanatical looting spree and amassing vast minerals for themselves and hoodwinking the indigenous with crumbs sharing formula based on two approaches i.e., corporate social responsibility (CSR) policies and royalties payment polices! AfCFTA’s failure is certain and already exposed by the reservations of the other nations since it is not driven by independent Islamic mentality and dispositions anchored on pure Islamic ideology divinely revealed by the Creator and whose measurement criterion of actions is strictly on halal/permissible or haram/prohibited. Instead, it is anchored on a pseudo-independent colonial subservient mentality driven by secular capitalist ideology that uses benefit and loss as its criterion for actions’ measurement. Africa’s Renaissance is dependent on its Embracement of the Khilafah Project as a substitute to the Western Colonialism that is the root cause of its miseries. The Khilafah (Caliphate) established on the Prophet’s ﷺ methodology shall guarantee peace, tranquility and prosperity due to its execution of the Islamic ideology and systems emanating from it comprehensively by utilizing its resources and establish guidelines governing trade/commerce as dictated by Islam. Furthermore, Under the Khilafah, Africa, with its vast resources, shall be secured and utilized for Africa and the colonialists, with their multinationals, will be chased away under the able leadership of the Khalifah (Caliph) who is motivated by seeking the pleasure of Allah (swt).